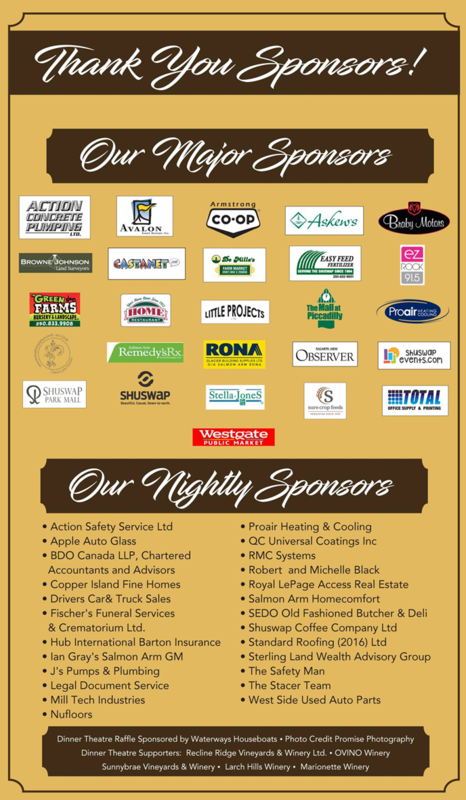 OUR MAJOR DINNER and NIGHTLY THEATRE SPONSORS CONTRIBUTE TO OUR SUCCESS. The value is $9080.00. Thank you Waterways! To see images of the Genesis 66 Houseboat, click here. Thank you to H2O4U Water Pure and Simple for keeping the staff and volunteers at R.J. Haney Heritage Village hydrated! It is going to be a hot summer! Thank you to the local businesses, organizations and individuals that support the many events at the Village. It is through your strong commitment and participation that R.J. Haney Heritage Village & Museum continues to succeed in telling the stories of our rich Shuswap history. If you would like to support the events or projects at the Village & Museum call 250-832-5243.